One of the most prominent advocates for consumer debt relief has ties to firms that can leave people deeper in debt. Howard S. Dvorkin is the founder and former president of Consolidated Credit Counseling Services Inc., a nonprofit that says it has helped more than five million Americans get their borrowing under control. Mr. Dvorkin says he has personally counseled at least 40,000 people on reducing their debt and navigating bankruptcy. Mr. Dvorkin also owns interests in businesses that provide services to payday lenders, a Wall Street Journal review found. These are firms that make short-term loans carrying triple-digit annual interest rates. One of the businesses in which he has a stake said in 2009 that it was itself offering payday loans. That lender’s website said it charged annual percentage rates between 235% and 782% on 14-day loans. Its site in 2012 said it was still offering payday loans. Payday and other online lenders can turn to another company Mr. Dvorkin has a stake in to find customers and obtain software to be more efficient, the Journal found, and until recently to help in setting up collaborations with Native American reservations. Some online payday lenders claim immunity from state usury laws by affiliating with reservations. Told of documents showing that firms in which he owns interests either had offered payday loans or supplied services to payday lenders, Mr. Dvorkin said he didn’t control these companies. He said he couldn’t be familiar with every detail of the daily operations of the many businesses he has owned, founded or invested in. He later said that in firms he controls, “I expect the management teams to ethically operate these businesses while strictly adhering to the law.” Mr. Dvorkin didn’t respond to requests for more information about the size of his ownership stakes. About 12 million Americans take out payday loans annually, according to the Pew Charitable Trusts. The term derives from lending to people who need cash to tide them over until their next paycheck. Nick Bourke, a consumer-debt researcher at Pew, said payday loans average an initial $375, for which borrowers typically spend more than $500 on finance costs. The costs mount primarily because many borrowers can’t afford to repay for several months. Internet payday lenders tend to charge higher rates and draw more complaints than traditional storefront lenders, Pew said. When speaking to the Journal, Mr. Dvorkin said “there is a place” for such high-cost loans to serve borrowers with no other options. A spokeswoman for the Community Financial Services Association of America, a trade group for what it calls nonbank lenders, said payday loans “help consumers overcome a short-term budget shortfall with a cash infusion” and often are the least-expensive option. The Consumer Financial Protection Bureau is seeking to impose regulations on payday loans, the Journal reported last week. James Hargis, a 34-year-old advertising worker in Murfreesboro, Tenn., said he took out a $300, two-week loan from an online payday lender called Dollar Premier in August 2013, a time when he was being treated for renal-cell cancer and needed money for medication. Unable to repay the $390, including a $90 finance charge, that was due two weeks later, he renewed the loan a number of times. After a few months, he said, he realized that he was paying only finance charges and that his balance had grown to $1,328.75. The day after he first fell behind, he said, Dollar Premier began dialing him incessantly, including a call to his work phone that his supervisor picked up. “It was beyond stressful,” he said. Dollar Premier’s general manager, Stephanie Tirres, said the lender reached Mr. Hargis a total of six times by phone and never more than once a day. Ms. Tirres said Dollar Premier uses loan-management software provided by Epic Loan Systems. Epic is a unit of a company called Advance Loan Technologies that, according to Florida corporation records, was started in Mr. Dvorkin’s home in 2010. In an interview, Mr. Dvorkin said he is a part owner of Advance Loan. In a U.S. patent granted in February 2014, Advance described software that can feature what it called the “bounce-bounce process.” If, for example, a payday lender made a $100 loan and the borrower couldn’t repay, the software could enable the lender to charge a 30% finance fee and automatically send the bill for this fee to a debt collector, according to the patent. Epic’s president, Brian Martin, said the “bounce-bounce” feature is used to stop any additional scheduled payments should the consumer default on two consecutive payments due and is pro-consumer. Mr. Hargis complained to the Better Business Bureau. In April, Dollar Premier forgave his outstanding balance. Mr. Dvorkin, 50 years old, grew up in Toms River, N.J., where his father was a plumbing-supply distributor. The week before his bar mitzvah, he recalled, his father stumbled into his room and died in his arms. Afterward, “my family was dirt poor,” he said, one reason he was driven to become what he called a serial entrepreneur. Short and stocky, Mr. Dvorkin overflows with energy. He said he drinks six cups of black tea a day and sleeps only four hours a night. After earning an M.B.A. at the University of Miami, Mr. Dvorkin in 1993 founded Consolidated Credit Counseling Services, in what he described as a 10-by-7-foot former janitor’s closet in Fort Lauderdale, Fla. It grew to be among the country’s largest credit-counseling firms, helped by Mr. Dvorkin’s focus on efficiency through automation. In the 12 months through June 2013, Consolidated generated $31 million in revenue, its most recent tax filing shows. Its commercials, swarming with animated green creatures that Consolidated calls debt suckers, are common fodder on cable television. Mr. Dvorkin said Consolidated was among the first to offer credit counseling over the phone, reducing costs. He parted ways with the firm in 2013, though he is still president of a private company that provides call-center services for Consolidated. Consolidated was just one of many businesses Mr. Dvorkin has founded, both for-profit and nonprofit. The for-profit ones employ 650 people, he said. They aren’t public and don’t disclose revenue or profit. More than 40 companies affiliated with Mr. Dvorkin list addresses as the same mail box in a United Parcel Service store in a strip mall in Plantation, Fla. Florida corporation records for the companies show Mr. Dvorkin as registered agent, managing member or president, or list as managing member a firm of which he is president. He runs his businesses with a keen focus on keeping costs low, he said. Several share office space. He refuses to stock Post-it Notes, telling employees to rely on a machine that binds scrap paper into pads when needed. In 2005, after federal legislation required that people filing for bankruptcy receive financial counseling, Mr. Dvorkin co-founded a for-profit company to provide it. Called Start Fresh Today, it charged clients $50 for courses on how to manage their finances. Another venture in which he owns an interest, Access Financial LLC, operates call centers for various businesses, Mr. Dvorkin said. Access said in a 2009 news release that it made payday loans. It used the name Fastwire Cash. According to pages on Fastwire’s old website from 2009, it charged annual interest rates of up to 782%. The firm’s old website from 2012 shows it was still offering payday loans then. An executive listed as a manager at Access Financial in 2013 didn’t respond to requests for comment. 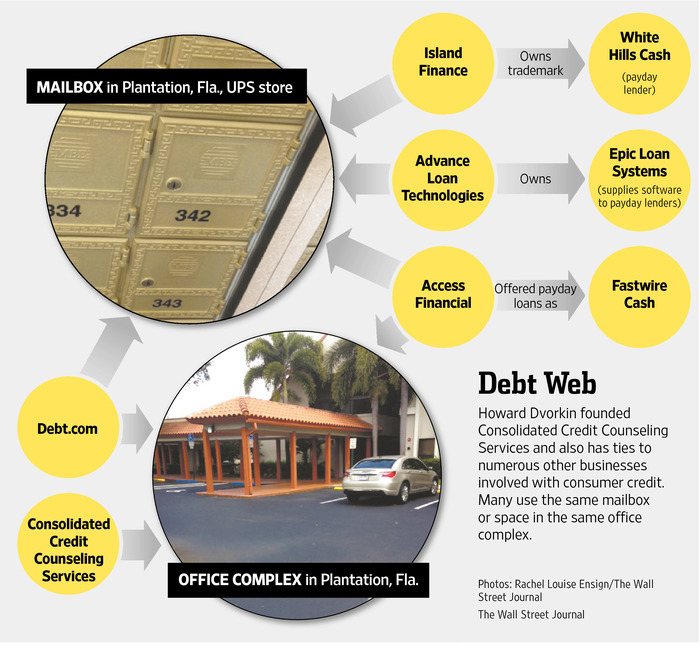 The trademark for a payday lender called White Hills Cash, according to U.S. Patent and Trademark Office records, is owned by Island Finance LLC, which lists its address as the UPS mail box in Plantation, Fla., shared by many other Dvorkin-affiliated firms. Montana corporation records from 2011 show that Island Finance obtained a secured loan from a company called YMF LTD LLC, which lists as its address the same UPS mail box that is listed for Island in the U.S. trademark filing. Mr. Dvorkin is the managing member of a company by that name registered in Nevada, according to Nevada corporation records. In addition, a 2013 Securities and Exchange Commission filing lists Mr. Dvorkin as managing director and sole officer of a Cayman Islands company called YMF Ltd. Asked about the relationship between the two YMFs, Mr. Dvorkin didn’t clarify it other than to say they aren’t the same entity. Asked whether any of his companies had made loans to Island Finance, Mr. Dvorkin said he didn’t know what Island Finance was. An Island executive didn’t provide any information. According to the patent obtained by Epic’s parent, the software could compile borrowers’ personal information, such as email addresses, phone numbers and Social Security numbers. It could also scour borrowers’ loan histories and, if it uncovered any unpaid balances, offer information about them to lenders that are trying to collect on those debts, the patent document said. Mr. Bourke of Pew called that an unusually aggressive feature. Epic’s Mr. Martin said its software has changed considerably since the patent was filed, and the debt-collection feature isn’t included in the system. In 2012, Stacy Wooley, of Redding, Calif., began getting calls from MoneyKey, a short-term lender that was also among Epic’s clients, according to website records and an email reviewed by the Journal. Ms. Wooley said that although she had never applied for a loan, MoneyKey called repeatedly asking her to “finalize” a loan application. “They called me like 20 times in one day,” said Ms. Wooley, a 29-year-old registered nurse. MoneyKey general counsel Jay Vaghela said the firm tried to contact Ms. Wooley only three times and stopped once she said she hadn’t applied for a loan. Epic until recently offered to help short-term lenders set up operations on Native American land. “You don’t have to know how to create and manage a Tribal Relationship. We’ve done the groundwork for you!” its website said until late September, when the Journal asked Mr. Dvorkin about its practices. Epic’s Mr. Martin said this was dropped from the site because a joint marketing campaign Epic had is no longer active. He also said the tribal model is a legal description for lenders, and Epic, as software, can’t facilitate a legal designation. Mr. Dvorkin called Epic a side of the business he wasn’t familiar with. “It’s a very small holding of mine that doesn’t come up on my radar,” he said. He didn’t say who else owned a stake in Epic parent Advance Loan. Mr. Dvorkin said he is focused on a new for-profit venture, Debt.com, for people with all kinds of debt, not just credit-card. Visitors to its website can enter their name, email address and phone number. Debt.com then connects them with merchants offering student-loan consolidation, bankruptcy advice and credit counseling. The site “generates leads for many, many businesses” that offer financial services helpful to people seeking to get their borrowing under control, Mr. Dvorkin said. He later said that it would be useful to any type of lender and would be shared only in aggregated form, not at the individual-account level. Mr. Dvorkin said he would make sure it was reused fairly and ethically. —Lisa Schwartz contributed to this article.